With a successful and historical business dating back to 1936, Davan Caravans & Motorhomes of Weston-super-Mare have been a local landmark for decades. However, with tourism being a main revenue stream for local businesses and a focus on land acquisition for new housing, the need for a dual carriageway arterial route in and out of town became integral to local council planning. The problem for Davan was that the new dual carriageway would now divert all traffic coming off the nearby M5 Junction 21 straight to the seafront, instead of the previous route which directly passed Davan’s premises, taking millions of potential annual footfall with it. To add more coal to this new fire for Davan, for any customers trying to locate Davan, missing a first turning off the new dual carriageway would take them miles out of their way and many would simply give up. During a busy last year which saw Red Thread Creative’s services being fully-integrated into Davan’s overall marketing communications platform, including the launch of a new multi-functional website and online shop, the issue of “how-to-find-us” was soon resolved. Having developed a successful digital, web-based service for our clients, our newly-integrated photography and video services that effectively support web-based communications would easily show visitors how to get to Davan from the nearby motorway junction. The concept was liked very much by Davan and our Creative Marketing Director came up with the tagline “Just 2 minutes from Junction 21”, which the business is (of course) if you follow the right route. First, we storyboarded the journey into the business from a driver’s perspective, off the motorway, taking time to draw all turnings and signs along the route. 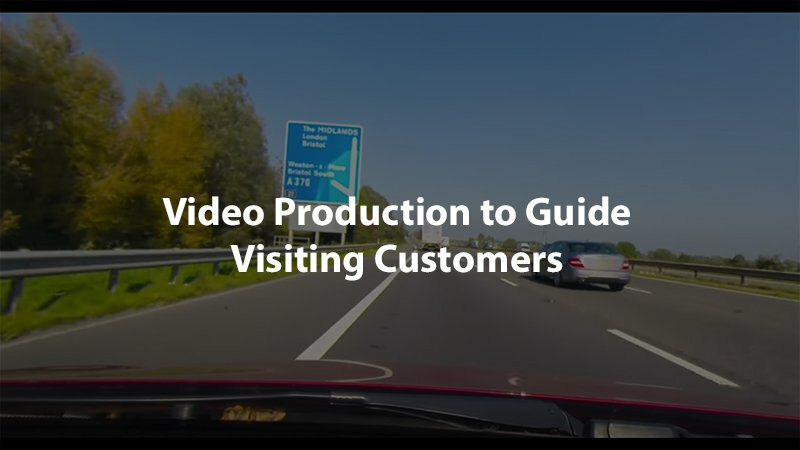 We presented a breakdown of the production into stages and gave our client a copy of our hand-drawn storyboard and timeline for the video to be shot from inside a car. Even when Davan became extremely busy and the project was delayed, Red Thread Creative stayed organised and ready to leap into action whenever we were given the nod. We watched the weather reports week in, week out for an opportunity to begin recording. We let our client know that we were running the risk of losing much of the good weather to the Autumn and Winter months and that it was now or never (or not for a long while ahead at least). With time being an issue our client agreed for us to get started. We set up two cameras, one on a purpose-built window mount and polished the car window screen (it is amazing how quickly your window screen gets dirty). We drove towards our destination monitoring the conditions and recorded both North and South bound journeys off the motorway and onto Davan’s forecourt. After filming all parts of the storyboard we headed back to our offices to begin editing the footage. Development of the video production for the editor was somewhat challenging, not only having to make challenging colour correction, but also masking all the vehicles number plates that were visible in the video. Hours of tracking number plates can be tedious, so it was a pleasure to source some fun music for this video production. We quickly settled on some country music that kept the pace of the video and made things more interesting and more upbeat. Once the North and South bound videos were finished we uploaded them to the clients Youtube account and created bespoke thumbnail graphics. Finally we embedded the videos into the clients website along with headings that repeat the tagline “Just 2 minutes from Junction 21”. We love the end result as much as our client and it really adds something special to their website. The embedded videos load quickly and look great on a mobile phone. We hope that these videos made by the team at Red Thread Creative help people get to Davan easily. If you’d like to speak to us about any video production or need videos created to use on your website, then we would love to hear from you.